I’ve been casually saying that I’m in the home stretch of graduate school all year, because relatively speaking—relative to having been a dietetics or pre-health student since 2010—I have been. But now I’m really in the home stretch, sprinting across my last few weeks of classes. Check, check, check. (Inconvenient symptoms to have when academic work is at its end-of-semester heaviest.) I was really surprised to notice cynicism and pessimism here; these attitudes have been cropping up a lot more than is usual for me, and it’s actually a relief to know that they may be linked to something bigger and broader than meets the eye. The article goes on to note that burnout can take a health toll, too, which I think is at least a part of the endless colds and IBS flare-ups I’ve been having this fall, winter, and spring. It’ll be interesting to see how I feel this summer, on my little break between completing the masters and starting my dietetic internship. I hope to dedicate a lot of that time to taking care of my body, resting, and getting back in touch with the things I care about. Some of this burnout, I know, is the inevitable cost of having been in school for a long time—I’m sure that anyone who’s undertaken a long stretch of graduate education, or even a substantial training process for any career goal, can relate. Part of it is having been enrolled in a program that was ultimately a mismatch for me. I’ve been taking these steps seriously in the last couple weeks, connecting to self-care more deeply and intentionally than I have in a long time. I’ve been saying no often, saying yes to the rituals that ground me, sleeping well, and putting love and attention into my meals and how I’m fueling myself with food. It helps. Community helps, too, and I’m not surprised that Valerie Bisharat lists it first among her suggested tools for managing burnout. I’ve been doing my best to stay connected to the causes and communities that I identify with: veganism especially, but also the ED recovery community and the wonderful community of food lovers I’ve connected with through blogging. Communicating and engaging with the folks who inhabit these communities reminds me why I’ve undertaken more training in the first place, and it helps me to keep a vision of future work alive. 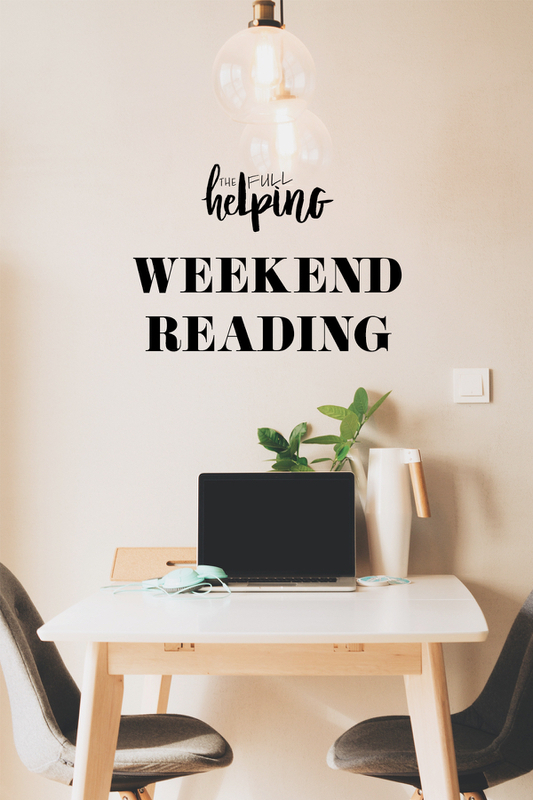 For the next few weeks, until this chapter is behind me, my task is to balance energy mindfully: giving the end of the semester what it needs, knowing when to rest and restore, staying inward and attentive while also reaching out when I need to. I’m figuring it out as I go along, but it’s reassuring to know that there are some best practices available. I guess it goes without saying that blogging is probably my most vital act of community-seeking. So, a big and humble thank you to all of the readers who show up here on Sunday and allow me to share. It means everything. I know I’ll feel much more like myself when I have more time and space to pour my heart into recipes around here. 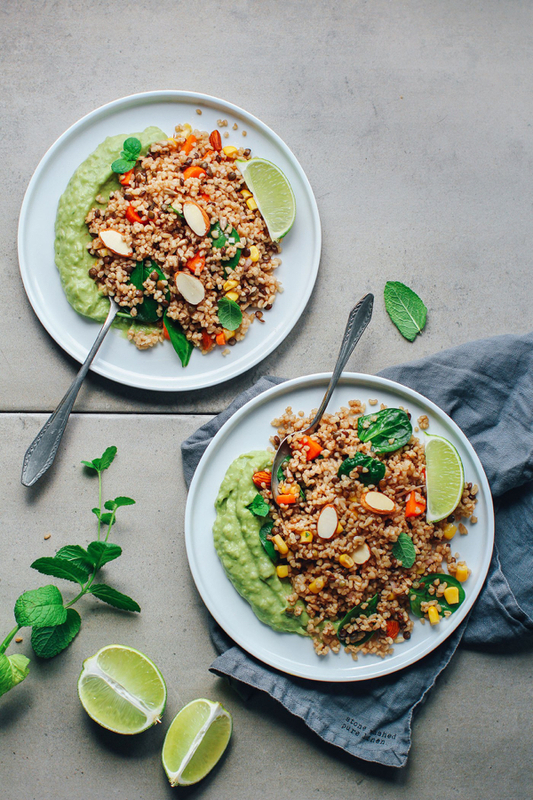 In the meantime, here’s a new crop of vegan meal ideas and reads. 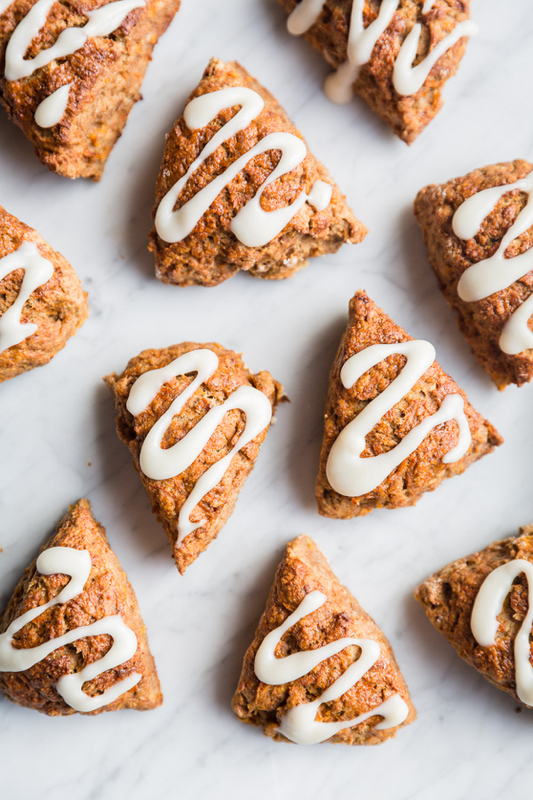 I’ve been counting on my blueberry banana walnut oat bake for weekday breakfasts lately, but I may need to make a batch of Sophie’s lovely vegan carrot cake scones sometime soon instead! Yum. 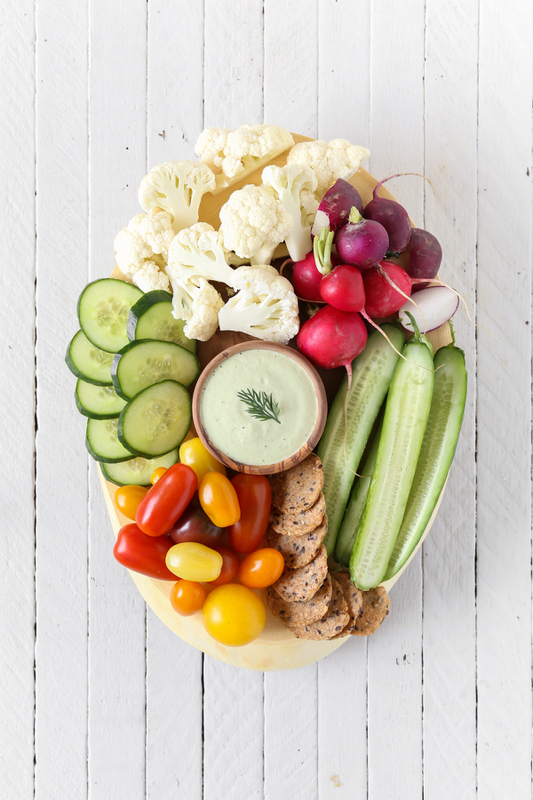 I usually make vegan tzatziki with cashews (there’s a recipe in Power Plates), but I love Margaret’s sunflower seed version and can’t wait to try it. 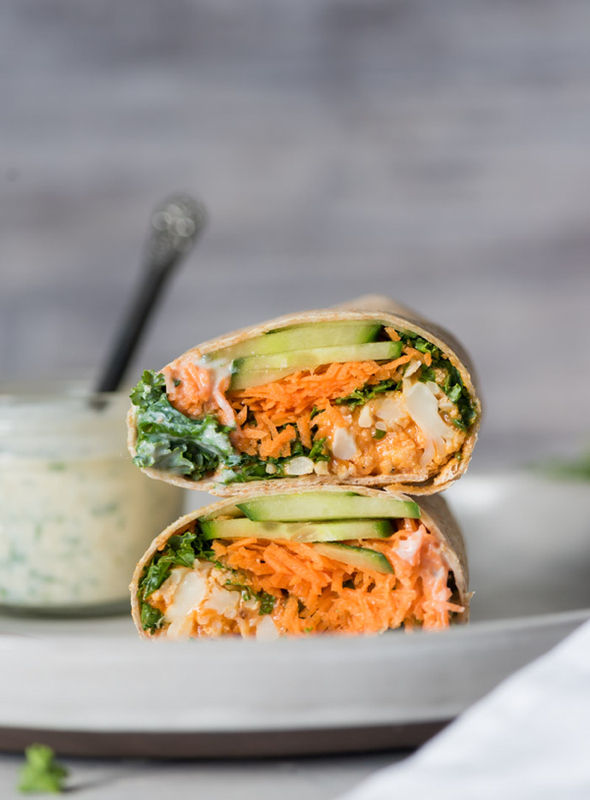 Totally digging Deryn’s buffalo cauliflower wraps (and love that they can be made ahead for weekday lunches, too). 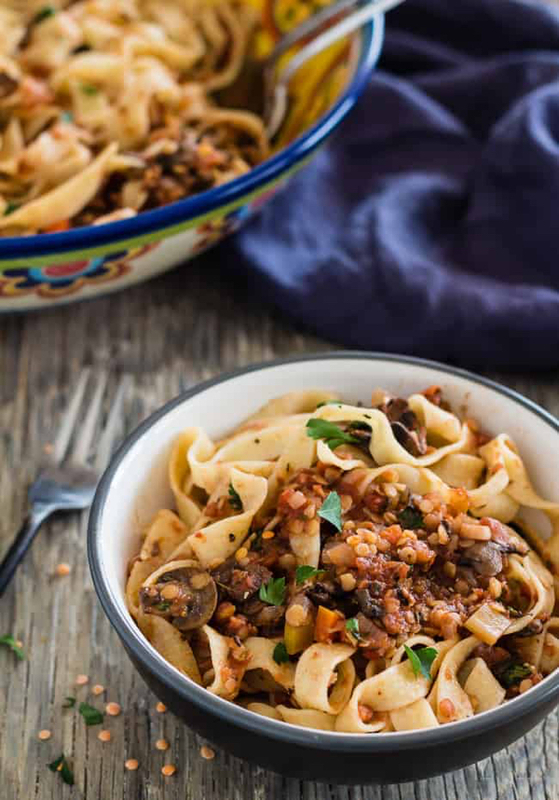 Letty’s spicy red lentil mushroom pasta looks delicious, nutritious, and comforting. Win, win & win. Thomas promises that his bulgur lentil salad is just what you need when the sun starts to peek out, and I think he’s right. Fresh and so pretty. 1. First up, Valerie Bisharat’s thoughts on working through burnout. 2. I’m not entirely surprised by these statistics, but that doesn’t make them any less disturbing: 1 in 5 teenaged girls participates in unhealthy dieting behaviors. 3. On a related note, dietitian Toby Amidor reports on the potential of Instagram to fuel orthorexia. 4. A good share for Earth Day: up-to-date facts and figures on how much produce gets thrown out in America each day. 5. Something hopeful: leftover corn stalks and husks may help to recycle e-waste, which is piling up in poisonous amounts in the US and globally. Before I go, I wanted to mention that, in honor of Mother’s Day three weeks from now, Farm Sanctuary is offering an opportunity for people to sponsor a rescued mother and child animal pair at one of its locations. I think it’s such a touching idea, and I’m symbolically “adopting” Nancy and Charlie. If you’re interested, you can check out the campaign here. Happy Earth Day, Sunday, and every day to you. Till soon. Wow! 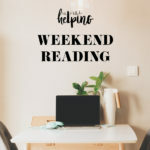 Gena, I look forward to your Weekend Reading post–each week with new tempting vegan recipes I want to make. I save most of them on Pinterest, for myself and for others to share. Thank you for sharing my Spicy Red Lentil and Mushroom Pasta in this week’s mix. I am honored.